'The Internet era has conjured forth mountains of nonsense about the death of copyright. Reformers have claimed that copyright is dead because the Internet makes it impossible to control who copies what; copyright supporters have said that the Internet itself must be contained, to head off that grim fate. Author, Internet/technology guru and activist Cory Doctorow has written many articles (mainly on the popular and influential weblog Boing Boing) on copyright, Digital Rights Management (DRM) and privacy issues, but this little gem of a book brings all his insights and reflections together in one comprehensive, superbly written package. But it ranges far more widely than that. It's full of stories and histories, and most enjoyably quotable quotes. 'The Internet isn't just a copying machine, it's an audience machine'. 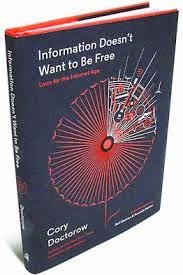 If you're at all interested in or fascinated by the many issues, problems and solutions thrown up by the Internet age then you'll cherish this book.